Hedge fund interest in Dollar Tree, Inc. (NASDAQ:DLTR) shares was flat at the end of last quarter. This is usually a negative indicator. The level and the change in hedge fund popularity aren’t the only variables you need to analyze to decipher hedge funds’ perspectives. A stock may witness a boost in popularity but it may still be less popular than similarly priced stocks. That’s why at the end of this article we will examine companies such as Agilent Technologies Inc. (NYSE:A), Cummins Inc. (NYSE:CMI), and Hilton Worldwide Holdings Inc (NYSE:HLT) to gather more data points. In the 21st century investor’s toolkit there are tons of formulas investors put to use to evaluate their stock investments. Two of the most underrated formulas are hedge fund and insider trading interest. Our researchers have shown that, historically, those who follow the best picks of the elite fund managers can outclass the S&P 500 by a significant amount (see the details here). 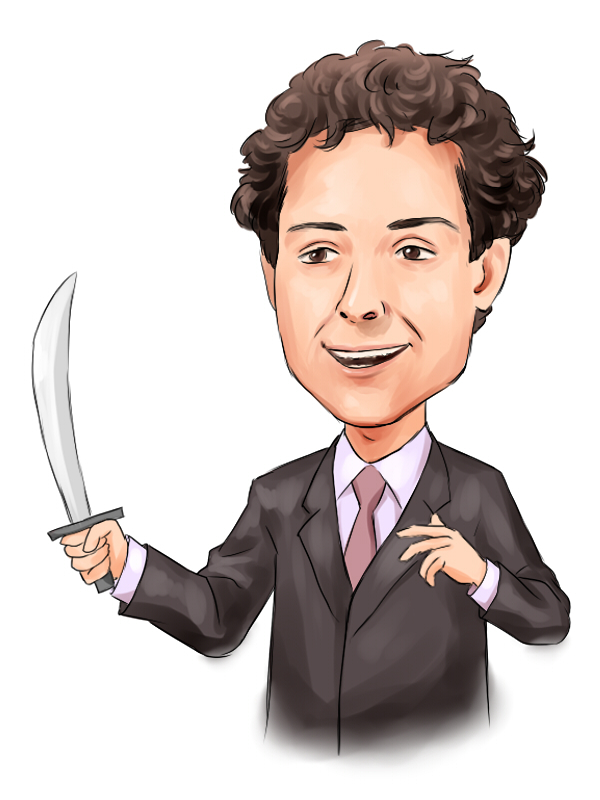 Let’s analyze the recent hedge fund action surrounding Dollar Tree, Inc. (NASDAQ:DLTR). At Q4’s end, a total of 53 of the hedge funds tracked by Insider Monkey held long positions in this stock, a change of 0% from the previous quarter. 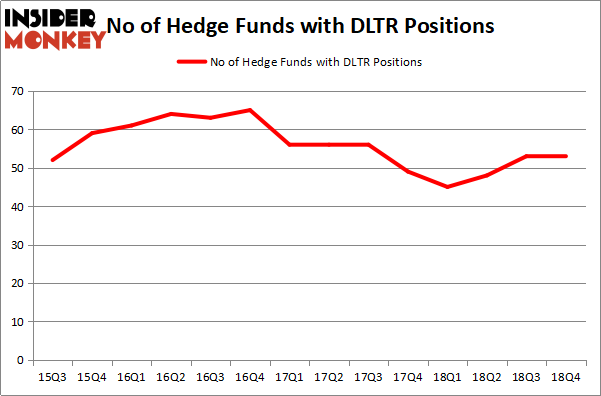 The graph below displays the number of hedge funds with bullish position in DLTR over the last 14 quarters. So, let’s check out which hedge funds were among the top holders of the stock and which hedge funds were making big moves. More specifically, Akre Capital Management was the largest shareholder of Dollar Tree, Inc. (NASDAQ:DLTR), with a stake worth $459.4 million reported as of the end of September. Trailing Akre Capital Management was Starboard Value LP, which amassed a stake valued at $234.5 million. D E Shaw, Citadel Investment Group, and Rivulet Capital were also very fond of the stock, giving the stock large weights in their portfolios. Seeing as Dollar Tree, Inc. (NASDAQ:DLTR) has witnessed bearish sentiment from the smart money, it’s safe to say that there was a specific group of hedgies that elected to cut their entire stakes in the third quarter. Intriguingly, Larry Robbins’s Glenview Capital said goodbye to the biggest position of all the hedgies followed by Insider Monkey, totaling close to $97.6 million in stock, and Howard Guberman’s Gruss Asset Management was right behind this move, as the fund cut about $85.6 million worth. These bearish behaviors are intriguing to say the least, as total hedge fund interest stayed the same (this is a bearish signal in our experience). Let’s now take a look at hedge fund activity in other stocks – not necessarily in the same industry as Dollar Tree, Inc. (NASDAQ:DLTR) but similarly valued. These stocks are Agilent Technologies Inc. (NYSE:A), Cummins Inc. (NYSE:CMI), Hilton Worldwide Holdings Inc (NYSE:HLT), and Atlassian Corporation Plc (NASDAQ:TEAM). This group of stocks’ market valuations are closest to DLTR’s market valuation. As you can see these stocks had an average of 39 hedge funds with bullish positions and the average amount invested in these stocks was $1950 million. That figure was $2163 million in DLTR’s case. Hilton Worldwide Holdings Inc (NYSE:HLT) is the most popular stock in this table. On the other hand Atlassian Corporation Plc (NASDAQ:TEAM) is the least popular one with only 34 bullish hedge fund positions. Compared to these stocks Dollar Tree, Inc. (NASDAQ:DLTR) is more popular among hedge funds but hedge fund sentiment is no where near its 2016 levels. Our calculations showed that top 15 most popular stocks among hedge funds returned 19.7% through March 15th and outperformed the S&P 500 ETF (SPY) by 6.6 percentage points. Unfortunately DLTR wasn’t in this group. Hedge funds that bet on DLTR were disappointed as the stock returned 10.6% and underperformed the market. If you are interested in investing in large cap stocks, you should check out the top 15 hedge fund stocks as 13 of these outperformed the market. Is IQVIA Holdings, Inc. (IQV) A Good Stock To Buy? Here is What Hedge Funds Think About AutoZone Inc. (AZO) Hedge Funds Dropped The Ball On Fortive Corporation (FTV) Were Hedge Funds Right About Flocking Into Sempra Energy (SRE)? Here is What Hedge Funds Think About BT Group plc (BT) Were Hedge Funds Right About Souring On Canon Inc. (NYSE:CAJ)?